We have quite a few country lovers looking for equestrian properties in Andalusia, and Ronda holds some of the best! Oozing authentic Andalusian charm, this Cortijo-style property with horse boxes, paddocks and an arena, nestled in nature, perfect for hacking around on horseback! Owning an equestrian property in Ronda area is owning an ideal haven for horses, and its owners. 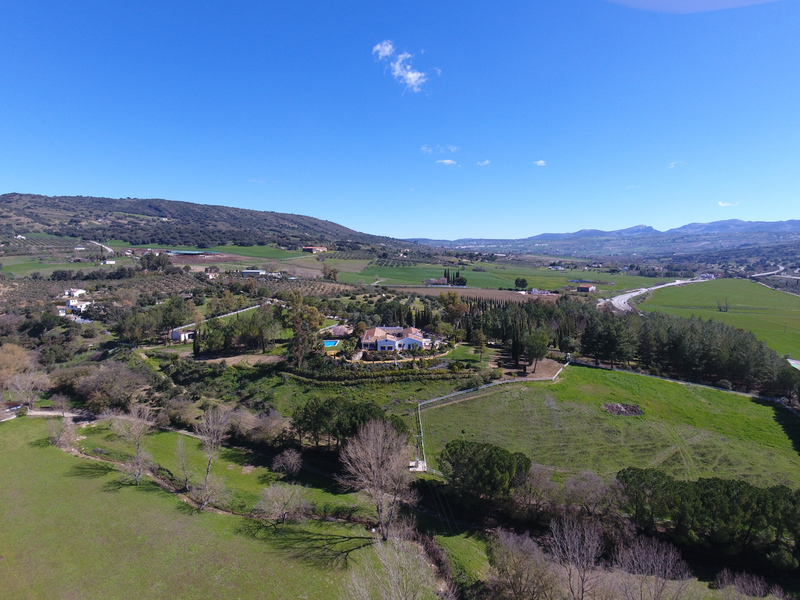 Whether it is as a private residence, a holiday home, or looking to start an equestrian business under the Andalusian sunshine, this could be the property you have been looking for! 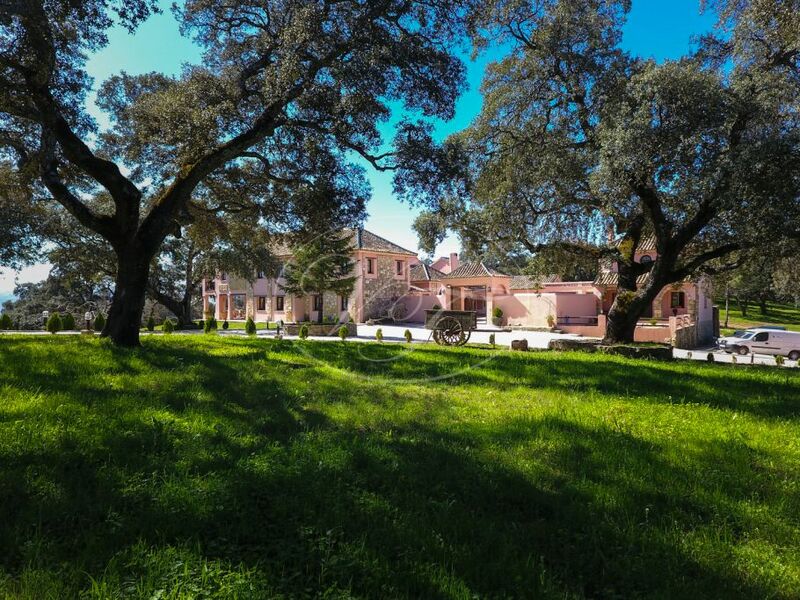 For someone who loves outdoor Andalusian living, this equestrian property in Ronda is ideal! Set just a few minutes from the historical town of Ronda, with views towards the Grazalema mountains and patchwork hills. This property, completely reformed in the 1980’s comprises the main house with two independent guesthouses. 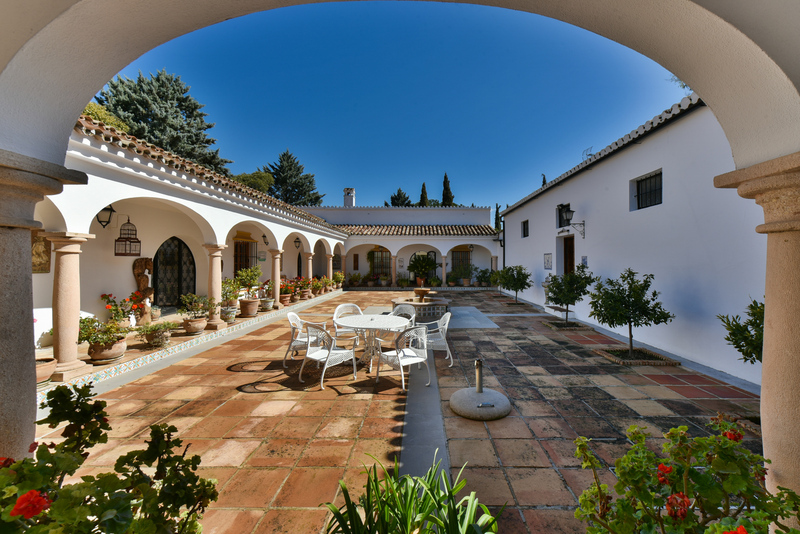 The housing and the horse boxes surround the centre courtyard with an elegant, Andalusian fountain. This country property has been beautifully maintained, with original details preserved from 1912! The large plot of land has been divided into various paddocks for the horses and arena. Thanks to its fantastic position, there are many horse trails through the century-old oak forests, grassy fields and through vineyards. Ronda is definitely up and coming in Andalusia’s viticulture, creating a name for itself with spectacular wines, lovely vineyards and bodegas dotted in the area. So why not take advantage, get in the saddle and trek to a nearby bodega and become a horseback oenologist for a day? If you are looking for different routes to take, there are an abundance of horse trails to enjoy. From this stunning equestrian property in Ronda, many treks can be made to discover it’s nooks and crannies, horseback adventures through the medieval walls, the Arab baths, the Virgen de la Cabeza natural balcony… Have a fabulous time trekking through the Mediterranean forests, the beautiful scent of the rockroses lingering in the air, indulging in Ronda’s history. A magnificent horse ride that is a must in the area is through the extensive countryside with the Guadalevín River which runs through the city, dividing it and carving out the steep, 100-plus-metre-deep El Tajo canyon above which the city perches. Taking a ride under the Puente Nuevo really is something special! Ronda is well-known for its history, and this attracts many tourists all year round. The village is continuously growing and bettering itself. Schools in the area are growing, with many offering bilingual classes. Many are offering outdoor and indoor activities, pilates in the Sierra de Grazalema mountains, water activities in the municipal pool and art workshops for those wanting to capture the beauty of the area by hand!